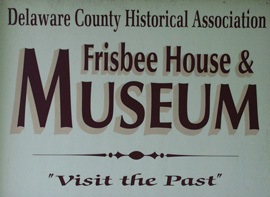 The Delaware County Historical Association (DCHA) was founded in 1945 by a small group of county residents. In the early 1960s, DCHA purchased the Gideon Frisbee Farmstead in Delhi. The property included the eighteenth century Gideon Frisbee House (now listed on the National Register of Historic Places), the Frisbee Barn, the family cemetery, and 60 acres of land and forest. In 1964 the house was opened to the public. In the 1960s and 70s the Association acquired three other examples of Delaware County vernacular architecture and moved the buildings to the site: the Amos Wood Gunshop, the Husted Hollow Schoolhouse, and the Tollgate House. In 1977 a library/exhibit building was completed. Three more vernacular structures have since been donated to the Historical Association: a historic church (now listed on the National Register of Historic Places) remains in-situ on the banks of the Delaware River next to one of Delaware County's surviving covered bridges; a blacksmith shop and its contents and a late nineteenth century corn crib have been moved to the site. Today DCHA offers visitors a wealth of activities and exhibits. Visitors can see how the past 225 years have shaped the communities and culture of the northern Catskills. The Merle Houck Nature Trail offers picturesque views of the Elk Creek valley and passes through the historic Frisbee Family Cemetery. Created by the Delhi Kiwanis Club, the trail is designed to educate our visitors and offer interesting glimpses into the natural world.